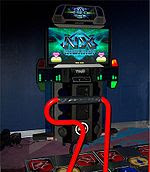 dzafin blog: WHAT IS PUMP IT UP NX 2 ?? The original version of the game was originally released in South Korea in August 1999. The game has also been released in other markets, such as North America and South America and in Europe. The current version of the game is Pump It Up NX2, which was released worldwide in January 2008. Pump it Up has tried to cater more to Freestyle players than "technical" players with more freestyle-friendly charts, as a result the game has more of a culture in the freestyle and breakdancing disciplines. However, the game still caters well to technical players with a vast array of high difficulty songs and stepcharts. The channel arrangement on NX was altered, now featuring a default channel containing all 29 new Arcade Station songs. A new game mode added to NX is World Tour, a group of 64 missions of 3 songs each, all containing various challenges such as passing a song, or completing a song with specific conditions or goals to accomplish. Each mission is named after capital cities of various nations throughout the world as well as after the developers of NX at Nexcade - where over 95% of charts are unique charts for existing songs, not playable anywhere else. The Remix Station from Zero has been changed to the Special Zone, an area containing nonstop remixes, long versions of songs, and Another mode songs. All of Pump it Up Zero's Another songs have also been moved to the Special Zone. Most of the unlocks however, depend on playing through World Tour mode. In addition, a new cabinet style has been added to the lineup, the new FX cabinet (pictured above), features a futuristic design and a 42' plasma display. Yahpp, who split from the BanYa team, has become the project lead. His solo works make their first appearances (Chimera, Arch of Darkness, Final Audition Ep. 2-1/2-2, Witch Doctor #1, and Fire). Yahpp's approach to the game led to NX having a distinctly "old-school" style which hasn't been prevalent in Pump It Up in many years.